Please do not throw away the over ripe sorry looking bananas! I bet every home once in a while goes through the time when the kitchen is filled up with the aroma (or the stink for me, for I am not a banana person at all) of the bananas turning black and ugly. Not a happy sight on that counter top. I think many times before I get ourselves a bunch of bananas; this time was different. DD2 was going through a phase when she wanted bananas for snack and lunch. Then just as expected from a fickle 4 year old, the bananas had no use in her life any more. The passion was gone, the bananas did not taste the same anymore, it is a fruit for the creatures who swing from the trees and of course the final statement – “I do not want them anymore”. For myself I cannot stand the sight of black and brown bananas but I did feel guilty having them make their way to the trash can. It was a quick decision made for banana bread is not black bananas. Banana bread is good and probably the easiest thing to do, and banana bread with chocolate and nuts is even better. This is not a unique recipe. Most of you must already have made a banana bread at least once, but it is exceptionally easy to make, it is eggless and there is least chance that anything might go wrong here. Finally it is one healthy thing to eat!. Preheat oven to 350 degree F. Lightly grease a 9 X 12 loaf pan. Sift flour, cocoa powder, salt and baking powder. Combine flaxseed powder with 1/3 cup orange juice/milk/almond milk (depending on what you are using), and let it sit for about 10 minutes. In another large bowl combine oil, sugar, mashed banana, and the rest of the juice/milk/almond milk, vanilla/almond extract. Add the flaxseed powder mix to this and stir to combine. Add the flour mix to this wet ingredients and stir with a wooden spoon until just blended. This is going to be a sticky gooey mix. Dust the chocolate pieces and the nuts with flour. Carefully fold them into the dough. Spoon the dough into the loaf pan and bake for about an hour to hour and a half or till the toothpick comes out clean (it took 60 minutes in the convection oven). Cool completely for about 15 minutes before turning the bread over. Slice only when completely cool or it will fall apart. A bread which is nutty, filled with chocolate and with a fantastic texture! Banana bread is good, toasted and smeared with butter, or warmed up a little and served with ice cream for dessert or dipped in egg and milk and fried up as French Toast for breakfast or served just by itself with a cuppa or a few quick bites for a guilt free snack. See how fantastic it is? Be creative and use the bread any time of the day. How do you eat your banana bread? Just a few days back I mabe banana choco cake..that came out nice…loved ur recipe very much mainly there is no need to yeast…some how i don’t feel comfortable with yeast with a doubt whether it will come perfet or not…. What are the odds! I made banana chocolate pancake (eggless) yesterday evening after I had lots of over ripe bananas on our counter 🙂 These 4 year olds, I tell you are made of the same mould 🙂 Looks lovely. I am having some problem with the comments and slowness on my blog, hence disabled the comments to see if I can investigate the problem. So far no luck. 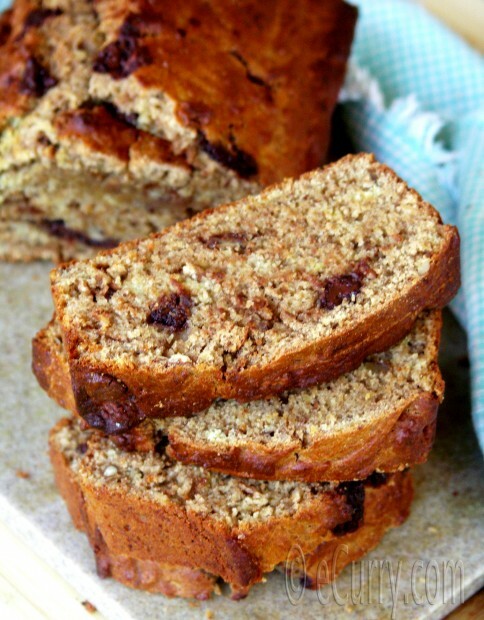 Yummy and healthy banana bread, awesome recipe! Soma, absolutely lovely. Banana nut bread, muffing you name it, it is loved by the DDs. Soma, lovely looking bread, I have made the eggless coffee banana bread, I am hesitant to throw away the bananas and end up using them loaded with sugar and all other ingredients enough to make me put on some more pounds. Yummy !! I religiously try almost all of your bread recipies…just lovely. Nice bread. If you wish, you can send this to my weekly bake-off. If you don’t want to make the bread, you can always keep it in freezer with skin on and thaw and use when you want it. Just a FYI. I never understood why kids have a temporary craving and all of sudden it dissapears! ahh I am not alone who hate banana in this world, but still couldn’t stand the riped banana smell 🙁 The bread is perfect! What a great way of using the sad bananas! Sad bananas indeed equal delicious bread! I secretly love it when my bananas start getting sad because it means I can bake a delicious loaf. This looks lovely. I too am not a banana person but what a lovely bread that too with chocolates! Yumm! Btw how many loaves did the above recipe gave you? Parita, it made just one loaf in a 9 X 12 pan. updated the post. Thank you. Delicious and lovely loaf. Aromatic and perfect the combo is. What can I replace flax seed with as its not available in local gorceries here in India? Flaxseed is available in India but with different names – Alsi, Jawas, Tishi, Agasi, Linseed etc. You can use applesauce too. I would think the banana itself binds instead of egg. Delicious and inviting loaf of bread ! Wow, that looks amazing! So delicious. In my case, the bananas don’t make it pass the green/yellow phase. I love them so much and use them everyday for my protein and breakfast shakes that I find myself buying bananas up to 2 times a week! I should save a couple to make this delicious bread. 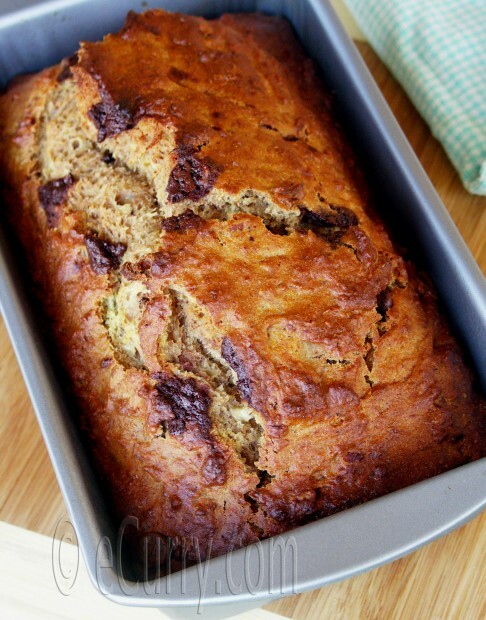 I LOVE banana bread and with chocolate and nuts it sounds perfect. You can never go wrong with bananas and chocolate. That’s my favorite combination too. My son is like your daughter. His taste for bananas keep changing every now and then. It is believed that one shouldn’t have bananas while having severe cold and phlegm, but my son will start craving for them just then and will make a big scene if I don’t give him. Bread looks very good…..fruitbread are perfect when it comes to making them eggless…..as for me I love bananas but don’t like to bake with them, they kind of overpower all other flavors, but do bake muffins or bread with them once in a while….till the little one was on baby food over ripe bananas were no problem, perfect for her baby food…..now baking pan comes out when occassionaly they come to bake or throw stage…. Shubho Noboborsho to u and ur loved ones!! Have a great celebration and happy feasting! Wish I was there when you took this gorgeous looking bread out of the oven. I love the idea of the almond milk as I have discovered that I am lactose intolerant! I do still use dairy for the bed and breakfast and normally would just take a little bite to check and see if things taste good. Bummer! Anyway, Soma, I always love everything you make, it shows that you are classy! Wish that I could offer you a position here at the lodge! Together we could make these tourists extremely happy. It pains me to see over ripe bananas on my counter too! But some times we can’t eat any more banana bread. Even though it is a favorite. Your bread is gorgeous – I still haven’t tried this technique of eggless baking. The results look great. The leaves I used in my recipe are the leaves of the Drumstick plant. Hope I was able to clarify. My best friend’s kid is allergic to eggs,so I am printing this recipe for her. This looks absolutely gorgeous Soma! I have never baked anything without eggs. Will it be as soft as the ones with eggs or there’s will be change in texture ? 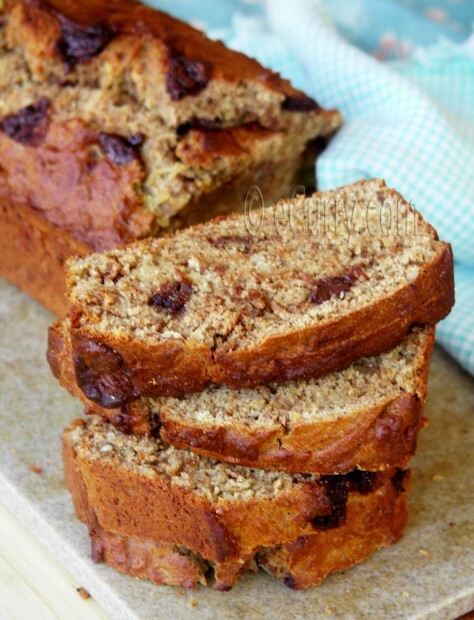 With this banana bread it does not make much difference. If you had to use eggs, you would use only one here. The texture is soft and moist. I tried this bread and I had a couple of issues with it. May be you can tell me where I went wrong? My bread was too moist and seemed undercooked (though it wasn’t undercooked) and I didn’t get that nice brown crust that I can see in your pictures. The bread will feel moist and sticky even it is fully cooked if the bananas were too ripe or if there is too much banana or too much liquid? . I do not know what kind of moist you mean, but the bread is supposed to be moist, like a moist cake. About the crust, did you by any chance place the pan in the lowest rack? then it would not have got much heat from the top. I cannot think of any other reason. With the cake feeling wet and the top not browning it sounds like it did not cook fully. Ovens vary and the bake time might vary a little than what it took for me to bake. Thank you very much for taking your time to write to me. You made my day! I tried this recipe. The bread isnt spongy or soft. It turned out to be quite squishy on the inside even after the skewer came out clean. I dont know what went wrong…..
Hi there !! Awesome piece of writing and highly educative. Good to view your current websites.